I’m not a comic geek, but something tells me after watching this movie that Stan Lee never imagined this story on the big screen. Sure, Thor is part of the Avengers series, thus requiring this character to have a presence in the film, but the creative concept of this comic hero just doesn’t complement the stories of Iron Man, The Hulk or Captain America. This movie fails because, unlike those other films, there’s very little connection to the human or Earth experience. Instead, most of this movie plays out in outer space, another dimension featuring real-life gods battling out a sibling rivalry. Yes, these are relatable human conflicts, including jealousy and the desire for acceptance from one’s father, but when these battles take place through interstellar portals with hand-to-hand combat fights on top of light bridges spanning different planets, it’s much too difficult to relate to anything that’s going on. This is Stan Lee writing ambitiously on a different and almost limitless canvas. On film there are boundaries of production restraints, running times and the jigsaw puzzle being formed with five other movies. Thor simply doesn’t fit. The film barely even needs Earth to exist, and most certainly it doesn't need any of its characters other than the teaser introduction showing a trio of scientists chasing down a storm system in the desert, which they think could open up a portal in space. Out of this wormhole lands someone we will learn is Thor, God of Thunder, moralized in human form on Earth. Flashing back we get to know Thor on his home planet of Asgard. He is the son of the revered king (another lazy performance from Tony Hopkins), who is dying and about to relinquish his throne to him. Sadly, Thor’s half-brother, Loki (Hiddleston), is left behind raging with internalized jealousy. When Loki learns that at birth he was actually stolen from Thor’s mortal enemies, the Frost Giants, he schemes to plot Thor’s downfall and claim the throne of Asgard. 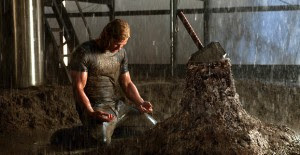 After going against his father’s wishes, Thor attacks the Frost Giants, thus breaking their peace and re-sparking war. For this, Thor is banished through the aforementioned wormhole to Earth to live out his life as a mortal, and without his main weapon and source of power, his hammer. On Earth, he’s a fish out of water trying to fit into the ways of humans while speaking his formal godlike English tongue to a group of collegiate do-gooders. The key battle of conflict which emerges out of this mess of a plot is between the two brothers, vying for power and the almighty hammer. There's actually very little action to even distract us. The main set piece occurs at the end when Thor battles a giant robot that can throw fire and blow things up real good. But there's so little creativity in the action, they're at best deleted scenes in a Michael Bay movie. This is my second time seeing this film, and even on sparkling Blu-ray the dank cinematography doesn't hold up. The big screen, ironically, was even worse. With The Avengers coming out next year and including an only slightly better Captain America as the final piece of the puzzle, there's much less cause for excitement for this series than when Iron Man was released.